I was spending a particularly hot week in Montreal, shuttling between the rooftop pool at my hotel and the cool interiors of some of the city’s most spectacular churches. With a bell tower almost always within sight, it was easy to duck into one church after another and escape the unseasonably steamy weather. Once inside, of course, I forgot all about the temperature as I admired the outstanding architecture and craftsmanship of each and every one of them. These are my favorites. The powerful effects of merely stepping inside the Basilique Notre-Dame de Montréal, one of the city’s most recognizable buildings, can be traced back to 1830. Construction had ended the year before, and the architect, James O’Donnell, was so transformed by his experience in building the basilica that he converted from Protestantism to Roman Catholicism upon his deathbed. He remains the only person buried in the crypt. 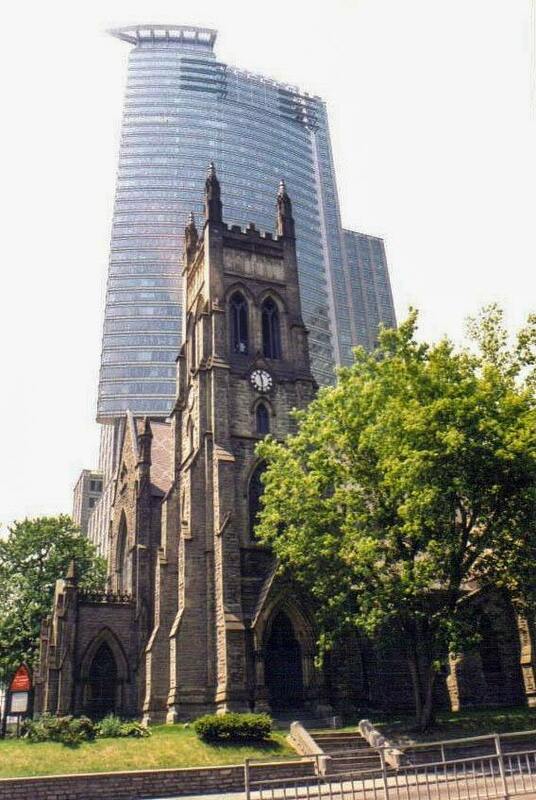 Canada’s first Gothic Revival church, with two almost oversized bell towers named Perseverance (which houses a 12-ton bell, one of the largest in North America) and Temperance that were added in the 1840s, remained the largest cathedral in North America for 50 years. Three statues in niches above the arched entrance — the Virgin Mary, St. John the Baptist, and St. Joseph — represent Montreal, Quebec, and Canada, respectively. The tremendous interior, which can seat 4,000 worshippers, is awash in painstaking details. Although somewhat dark inside, the azure, gold, red, purple, and silver colors soon start to pop, especially the vaults’ exquisite blue ceilings decorated with golden stars. A double-level gallery runs along the sides of the church, joining in the rear at the fantastic organ from 1891. Intricate wooden carvings range from the pine statues in the choir to the decorative motifs in black walnut to the linden wood ceiling in a chapel, not to mention the beautiful pews and the gorgeous pulpit, adorned with religious figures and symbols. 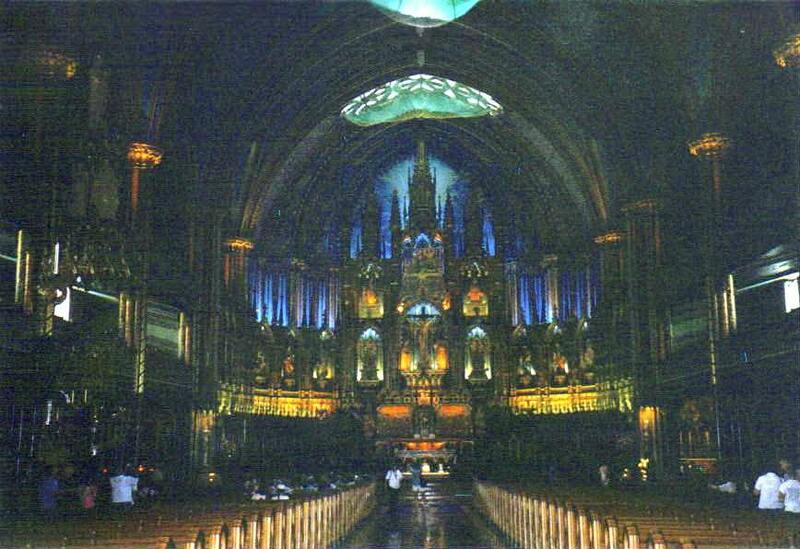 The stained-glass windows in the sanctuary depict scenes from the religious history of Montreal rather than the Bible. The floor slopes down to the main altar, which was hand-carved from a linden tree. As I made my way behind the altar to the more intimate and brighter Chapel of the Sacred Heart, I overheard a tour guide, a chap named Lucien who spoke exactly like Celine Dion (who was married here in 1994), relaying to his group how the chapel was restored and modernized in 1982 with a massive bronze altarpiece after a baleful miscreant with a can of gasoline and a match had his way. A short ride on the Metro from downtown Montreal brought me to the Oratoire St-Joseph, an absolutely enormous basilica with a giant copper dome turned verdigris green — the third highest in the world. It sits atop a hill that I climbed via one of three staircases, the third for pilgrims who choose to ascend 283 concrete steps on their knees. The largest shrine in the world dedicated to St. Joseph was completed in 1967 after decades of construction. Like the Basilica of Sainte-Anne-de-Beaupré, there is a display of thousands of crutches left by those who had come to the basilica and were healed through the miraculous intervention of Brother André Bessette, who was canonized in 2010. His heart remains in a reliquary in the church museum. An informative self-guided tour led me throughout the building and outside to the peaceful Way of the Cross and the simple chapel that Brother André built originally before starting on the basilica, which can now hold up to 10,000 people. The splendid Cathédrale Marie-Reine-du-Monde brings more than a little bit of the Vatican City to Montreal — it is, in fact, a replica of St. Peter’s Basilica, at one-quarter the size. Mostly completed by 1894, this minor basilica cost more than $1 million to erect, the first building in Montreal to reach that price tag. The façade certainly does evoke St. Peter’s, with its columns and pediment, and the dome rising behind it, but it’s missing the two clocks. 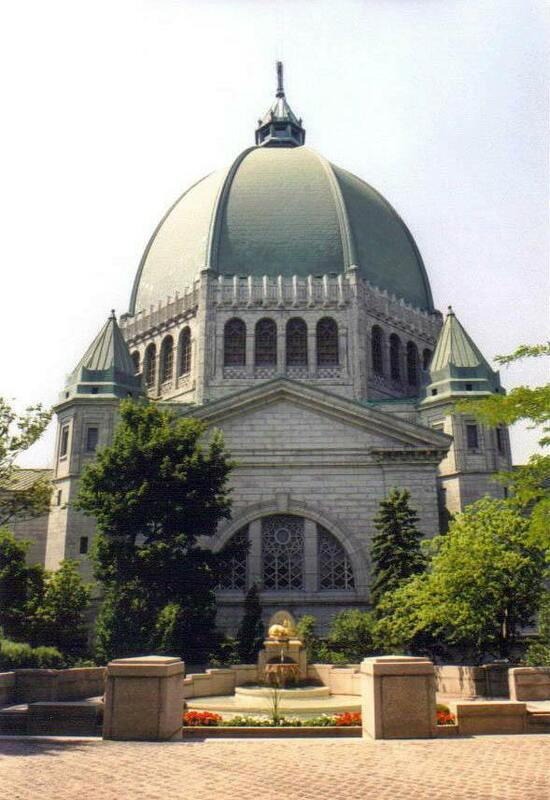 Like the Vatican, statues stand at the roofline, but, unlike their originals, these are not the Apostles; rather, they represent the patron saints of 13 Montreal parishes that donated them, all sculpted by the same artist. Inside, plenty of similarities abound, although on a less grand but nevertheless impressive scale: the coffered barren-vaulted ceiling above the nave, Corinthian columns, and the twisted columns of the baldachin on the altar among them. This cathedral has pews, however, allowing visitors like me to sit and take it all in: the paintings depicting historical events in Montreal, the great organ, and Biblical texts written in gold letters. One of the more curious details is the crucifix above the marble baptismal font: Sculpted in stucco, this material gives the impression that Christ’s flesh is decaying, and the sign above Him identifying him as the Nazarean is written backwards. Named for the patron saint of England, St. George’s Anglican Church was designated a National Historic Site of Canada in 1990, 120 years after it was completed. The carved sandstone exterior was fashioned in the English Gothic revival style, complete with plenty of wonderful pointed arches that you’ll find everywhere — the windows, the entrance, the bell tower, and throughout the interior as well. The inside is a gorgeous study of traditional English woodwork, including the fantastic ceiling beams, among the largest in the world. Tapestries from London’s Westminster Abbey, wood-carved angels, the blue ceiling over the altar, and the red wall around the organ add marked notes of vibrancy. Of all the beautiful stained-glass windows, a particularly striking one is the secular war memorial window, which depicts three angels bearing shields that represent the Canadian air force, army, and navy. Above each is a relevant Biblical passage, such as “Out of weakness made strong, waxed valiant in fight, turned to flight the armies of the aliens” (Hebrews II:34). 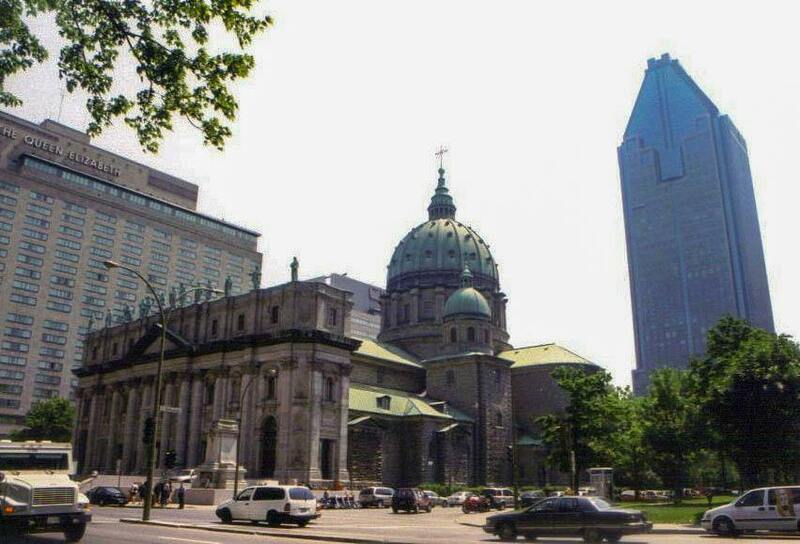 One of the oldest churches in Montreal, “Our Lady of Good Help” was founded by Marguerite Bourgeoys, who rallied French colonists to build a chapel in 1655 and was made a saint in 1982. After that initial church burned in 1754 (the wooden statue of Our Lady of Good Help that Bourgeoys had brought with her from France survived), the current church was completed in 1771. 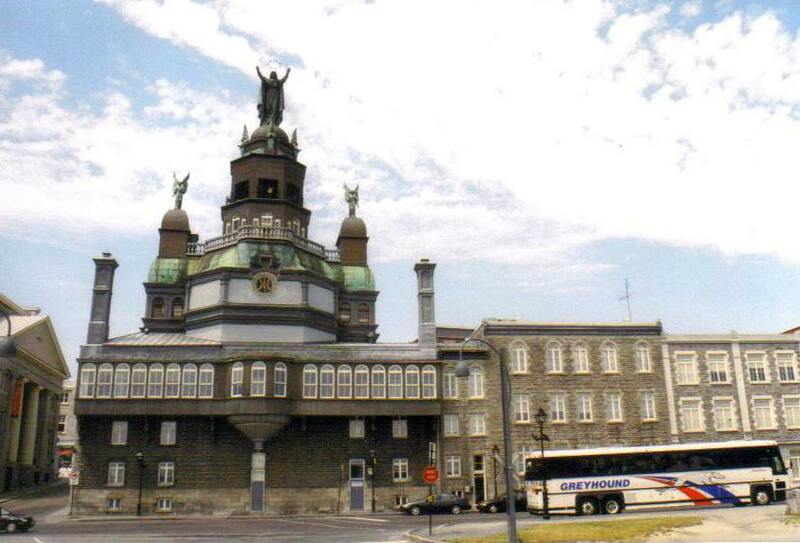 By the 19th century, it had become a pilgrimage site for sailors arriving in the Old Port, and it is still affectionately referred to as the Sailors’ Church. Today, it presents one of the most curious faces to visitors in the city. My initial view came from an aleatory turn down a cobblestone street that leads to its entrance. Blending in perfectly with its neighbors in this section of Old Montreal, the symmetrical stone façade features a red entry door; a central steeple that can be climbed for views of the Old Port and the Saint Lawrence River, topped by a verdigris octagonal bell tower and steeple with an iron cross; and two shorter towers. The rear of the church, however, looks like a completely different building. Those sailing into the Old Part on the Saint Lawrence River would have been stricken by this impressive site. A projecting enclosed balcony with 19 windows, bowed in the central section, runs the entire width of the building. A polygonal chapel rises above it, with two domes topped by angels and the taller central dome crowned by a statue of the Virgin as Star of the Sea that was added in 1849. Inside, among the barrel ceiling and stained-glass windows, carved replicas of sailing ships hanging from the vault reminded me of how much sailors revered this house of worship.